Eliminate paint finishes and other topcoats from fiberglass surfaces of vehicles using the Klean-Strip Fiberglass Paint Stripper - GAF354. Finishes such as lacquers, polyurethanes, epoxies, acrylics, and baked enamels can be conveniently and effortlessly removed with this paint remover. Known to show results within five minutes of application on paints that are not stubborn, this paint remover can go deeper into the topcoats to strip them. Hence, it lifts several layers and adheres well on vertical surfaces. Apply the paint remover and let it stand for a few minutes for it to do the trick. You may need to wait longer till the paint finish completely peels off or liquefies. The process may take any amount of time between 5 to 45 minutes. Scratch or abrade the finish in case you want the stripping action to happen sooner than its usual time. You need to apply the remover in generous amounts. A thin film or just plain brushing may not show results since thin coats tend to dry fast and cease their action even before the paint finish has actually corroded. If the finish you are looking to remove is unusually tough, and you do not want the automobile paint stripper to evaporate or dry out before the finish is completely blistered, use a 2-3 mil polyethylene film over the wet remover. Allow the paint remover to stay for up to 2 hours. If required, you may need to repeat the application. In case this automotive paint remover dries on the surface, scrape the loose portions and apply again. Use the water-washable Klean-Strip Fiberglass Paint Stripper - GAF354 on any fiberglass surface and this one gallon pack will help you get rid of tough paints. 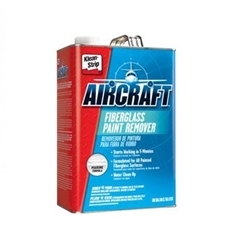 Use the water-washable Klean-Strip Fiberglass Paint Stripper - GAF354 on any fiberglass surface and this one gallon pack will help you get rid of tough paints. Storage: Store in a cool place. If exposed for long to temperatures above 90°F, the remover may leak or swell. Shelf Life: Use remover within 6 months after pack is opened. Dispose of properly to prevent can deterioration.